You all know I love a pretty wreath, and I can resist a beautiful strand of ribbon, so when asked to put new May Arts Ribbon Frayed Thread ribbon to use, I knew I was going to come up with a pretty Spring Ribbon Wreath. I love the natural look of this frayed thread ribbon, it reminds me of linen, and the pretty colors are perfect for spring projects. It was really easy to use too! Attaching the ribbon to the grapevine wreath was super easy. I used a small piece of wreath wire (twist ties would work too) to attach the ribbon directly to the wreath. Slightly slouch the ribbon strand and attach, working your way around the entire wreath. The little bucket I picked up at at the dollar store along with the bird and little flowers. I attached the bucket around a grapevine with doubled over Kraft bakers twine tied in a bow, too easy! 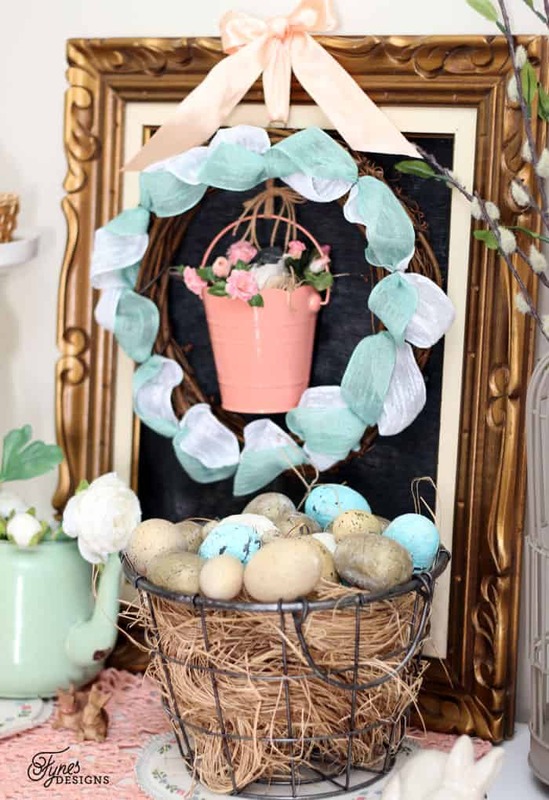 You could seriously put this wreath together in under 20 minutes! 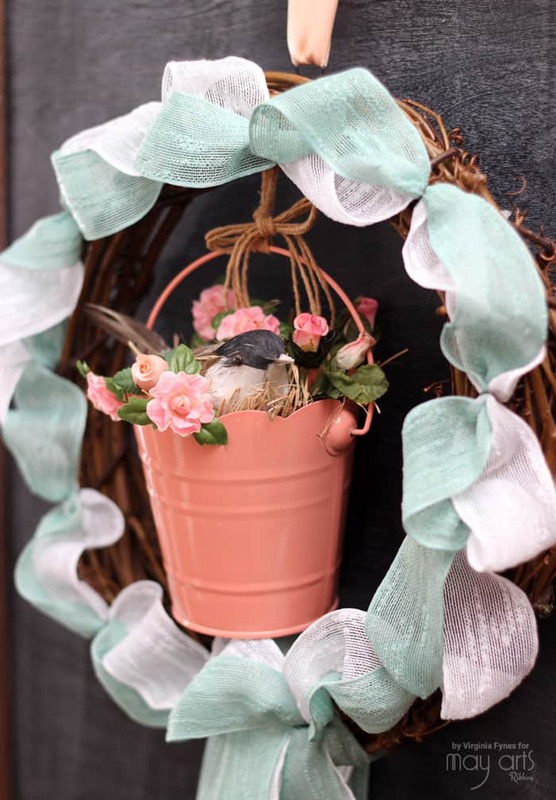 I’m smitten with my little birdie ribbon wreath, I can’t wait for spring to arrive and the birds to start chirping again! 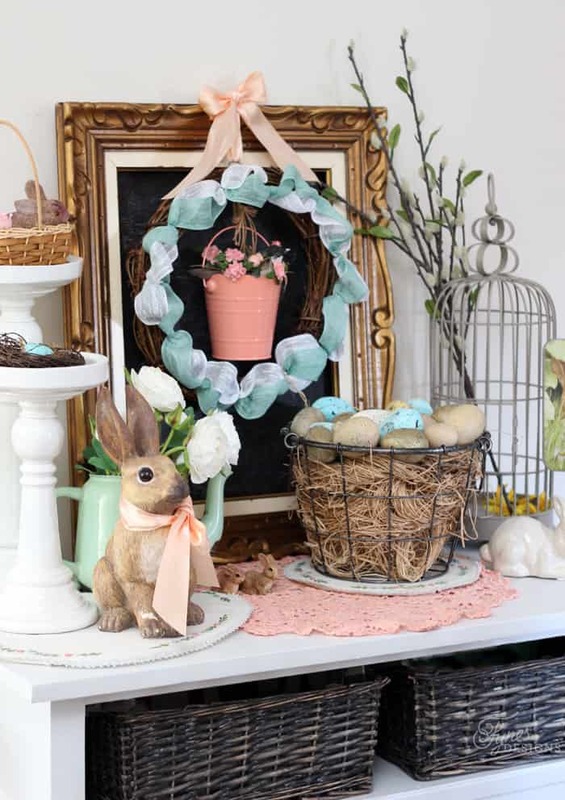 This Spring Easter Wreath is the perfect addition to this vintage Easter Vignette. 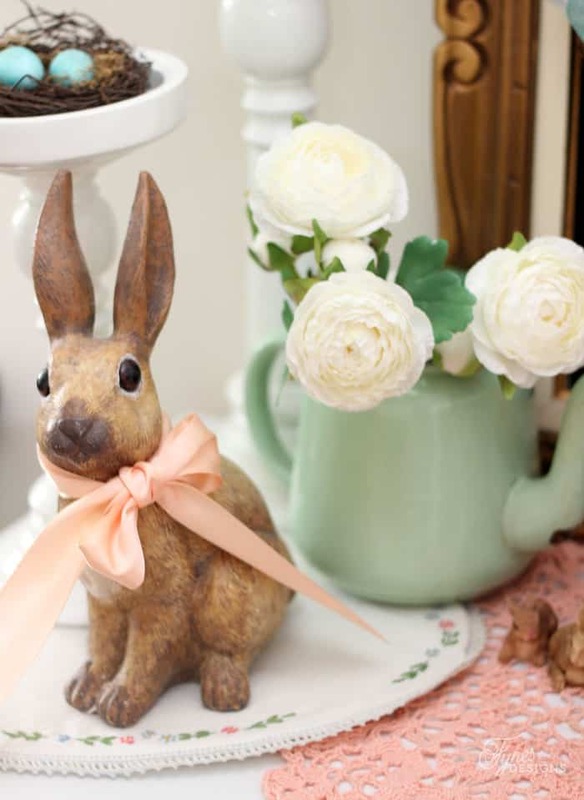 Isn’t Peter Rabbit the sweetest?! I love the muted tones, and the prospect of all the pretty things spring brings! 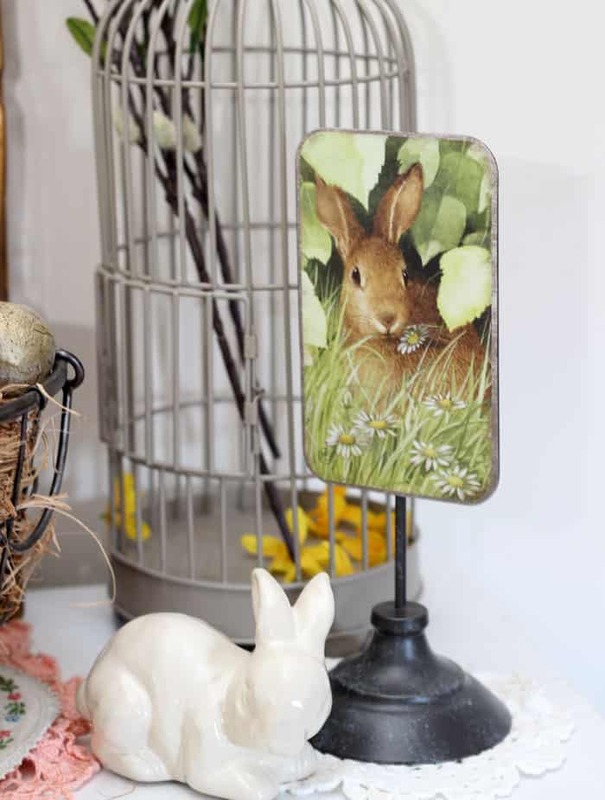 I hope you like my Easter vignette and would like to adapt some of these ideas into your spring decor. I love the frayed thread ribbon; it really makes this wreath stand out! 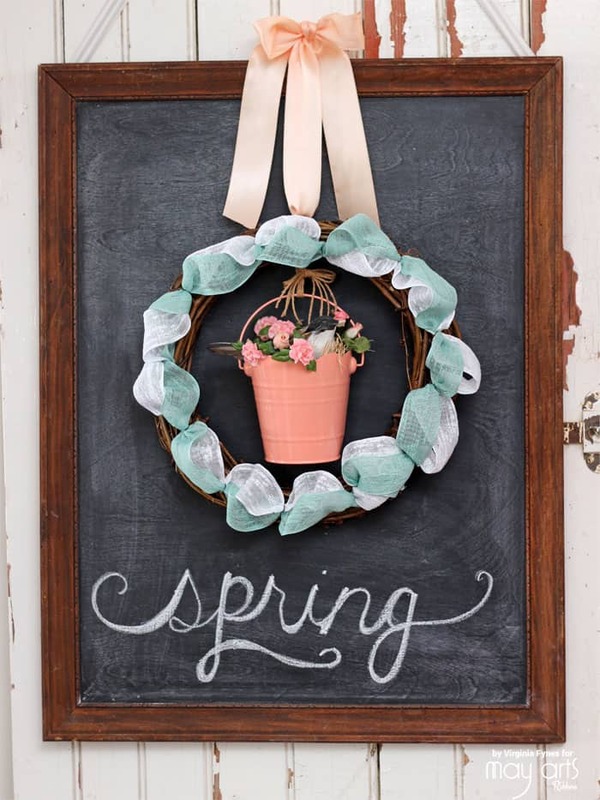 This is gorgeous ribbon that you made this fabulous Spring wreath with! Will diffidently bring the warmer weather faster with the warm well wishes it makes me feel! I am so with you for Spring getting here. Your wreath is bright and beautiful. thank you for sharing. So beautiful! I’m ready for spring! Gorgeous new ribbons. The wreath is so pretty. And it will be so easy to change out when seasons change or you want a different look. thanks for sharing a darling idea. So puffy and airy and spring-y… FAB! Love the close-up of that ribbon… WANT!! Great idea, love how it turned out! Beautiful spring wreath using this ribbon. 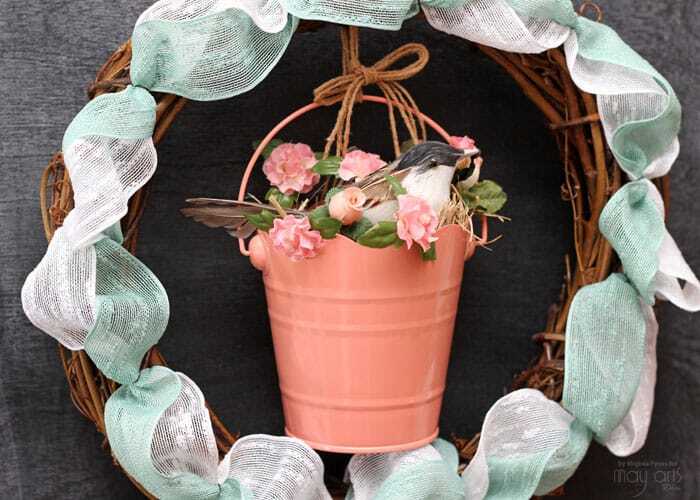 LOVE the texture of these new ribbons and how the loops frame your PRETTY flower-filled bird-nest pail – SUCH A CUTE & CLEVER design – LOVE IT ALL!!! Is amazing, and so, so beautiful, I love, this is my favorite project in this hop! What a pretty wreath. 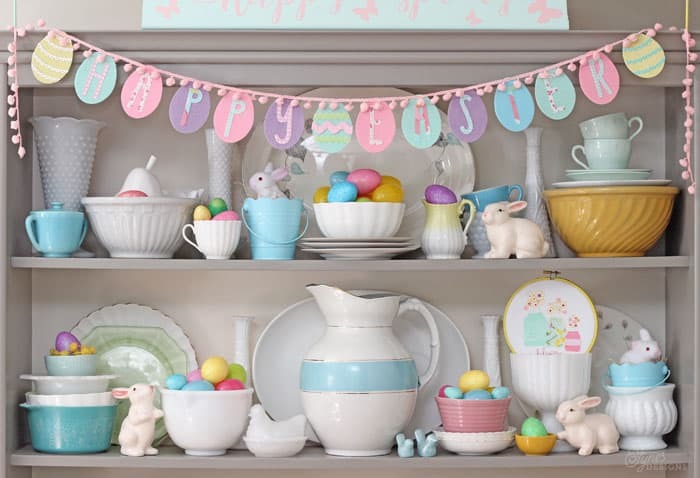 Love the ribbon and colors that you used. That pretty pink bucket with the bird is adorable. Thanks for sharing.